Joe was born and raised on Staten Island NY, just a short ferry ride to Manhattan where he attended The High School of Art and Design and college at Parsons earning a BFA degree. Since 1974 he has worked for most major magazines and newspapers as well as for corporate and advertising clients, book publishers and record companies. Clients have included: American Express, Audubon, Barnes & Noble.com, Capitol Records, Folio Society, The Nation, The New York Times Book Review, The New Yorker, The Rock & Roll Hall of Fame, Rolling Stone, Time and the Wall St. Journal. Among his awards are four silver medals from the Society of Illustrators. In 2016 he was awarded the Society's prestigious Hamilton King Award. 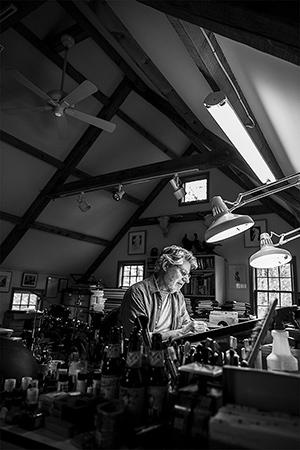 Joe has been profiled in Communication Arts Magazine as well as other graphic arts journals. In 1999 he had a one-man exhibition of his work at the Society of Illustrators in New York and in 2017 an exhibit of his work was at the Hunterdon Art Museum in New Jersey. Joe has illustrated Elmore Leonard's 10 RULES OF WRITING for Harper Collins and in 2011 a limited edition book of his blues musician portraits, BLACK WHITE & BLUES was published by Strike Three Press. 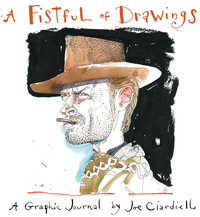 His latest book, a graphic journal titled A FISTFUL OF DRAWINGS is published by Fantagraphics (FU Press). A musician as well, Joe plays drums with a blues band and also with The Half-Tones, an illustrator jazz group. He lives in western New Jersey.